Some time ago, we installed some cheap overhead lighting in one room of our house. The light fixture were "track-like" but without the track - just three canister lights mounted to a metal bar that's screwed into the ceiling. These were cheap units in every sense of the word and when I removed two of them during a room overhaul, various parts fell apart rendering them useless as lights. Recently, I was contemplating mounting a full-range driver into a light canister mounted inside an armoire. I shelved that project for another day but decided to see what would happen if I tried it on a smaller scale in a computer speaker for my office. Here are the raw parts - canister light housing, Aura NS3-193-8A drivers from Madisound, and a small surplus JBL multimedia amplifier from ApexJr. The drivers arrived well packed in cardboard wrappers with plastic standoffs to protect the rubber surrounds. The Aura driver boasts some interesting specs (PDF file). The 3 inch driver has a very low Fs (80 Hz) for its size, decent power handling (20W RMS, 80W peak), is magnetically shielded, and has a large excursion (5 mm Xmax, 20 mm peak to peak max excursion). The potential for equalizing this driver to achieve a decently flat and wide response is intriguing. The main drawback is the low efficiency (80 dB 1w/1m) but that's ok given the intended use as a computer speaker. The JBL amplifier is the same one I used on the CeePeeDee project. I had a spare unit collecting dust. 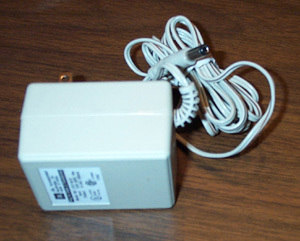 It uses a TDA7360 amp chip and has its own wall wart for power. To mount the driver to the white metal housing, I milled a ring of MDF on a drill press with a fly-cutter. Each ring was painted black to match the driver's flange. I cut a small notch in each ring to provide clearance for the driver's + and - wiring tabs. Each ring is glued to the canister with construction adhesive. The excess is scrapped off the outside after it has hardened somewhat. The driver is screwed in place with four sheet metal screws. Driver wiring runs inside the canister and mounting post. No attempt was made to "design" the enclosure. The internal volume for the canister is about 0.38 liters, not accounting for the driver; too small to be of use in any alignment with these drivers. Since this is for simple computer use, I opted to just enjoy them as they are. The holes in the rear of the canister (to let light bulb heat exit) are left as-is. The small amplifier PCB is mounted to the center of the light fixture assembly (where the third light canister used to be) on a piece of wood (which acts as an insulator). I made no attempt to house the amp in anything. With everything done, I mounted the light assembly to a shelf over my computer monitors with two bolts. How do they sound ? They're much better than the Altec Lansing/Dell multimedia speakers they replaced. Pointing them downward, they provide better coverage of the sitting position than desktop speakers. I did some simple informal A/B listening and everyone liked them better as well. 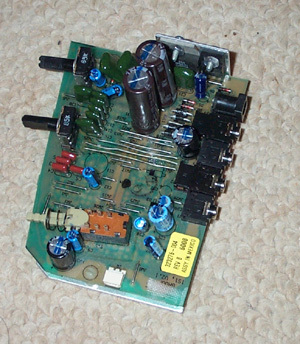 The main drawback is the lack of power on the amp and low output voltage on the sound card. The drivers are not all that efficient but do have loads of excursion. I fed some 60Hz hum and they were able to move some serious amounts of air. The canisters are very stable. There's enough friction in the joint to keep the speaker pointing in whatever direction I want yet still allow me to move them easily and accurately. My initial tests showed minimal vibration in the housing. But subsequent usage showed that the cans not only vibrated a good amount when the volume was turned up, but the vibration was also transfered up the supporting joint to the overhead bar. In the office setup, the vibration continued to the plywood shelf, then down the center supporting leg to the desktop. I could feel the vibration with my wrist resting on my keyboard. As luck would have it, I had to remove the speakers from this setup so they are now sitting about collecting dust. When I get the chance, I'll try applying EQ to see how flat and low a response I can get. I'll also try filling the bar with clay to help deaden it.